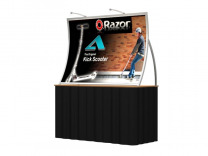 Classic Exhibits takes a very successful custom modular hybrid displays system and offers a great new product in the table top arena that gives your presentation a sophistication that you’ll not see in pop ups or flat panel systems. 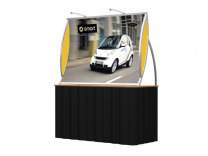 The Perfect 10 tension mounted dye sublimation fabric graphic mounts easily to the high quality, easy to assemble frame which comes in 7 different powder coated color options, sintra in-fills, and two halogen lights, and packaged in its’ own custom molded shipping case. There's nothing quite like the Perfect 10 Portable Hybrid Displays. Easily recognizable, utterly unforgettable. When you name a product Perfect 10, it had better be perfect and with Perfect 10 you get flawless performances with all your trade show displays. Classic Exhibits has created several new outstanding products in the past few years that capitalize on lighter weight materials such as extruded aluminum and fabric, to bring new market driven products to the trade show exhibit industry. What did Classic see that gave them the initiative to forge ahead during bad economic times to create new marketable products? They happen to notice that one or two of the aluminum shapes that they'd been purchasing at that time, had a significantly lower cost per linear foot in comparison to others, and determined that those shapes should be taken into account for future product development. With the help of a innovative staff and a solid vision of the future, they've been able to bring to market, a series of very successful new lines of custom modular hybrid displays. You may have been aware of some of the excellent new lines that Classic Exhibits developed recently, starting with the Perfect 10 and Magellan Miracle tension fabric display systems, followed up with the Sacagawea custom modular hybrid display system. For the distribution network for Classic Exhibits products, the future looks bright because of the creativity and ingenuity on Classic’s part, and some great promotion through an online program they created called exhibit design search, which is an online search program for trade show displays which we utilize extensively on the ShopForExhibits.com web site. 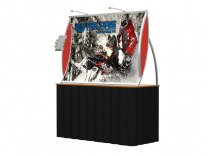 ShopForExhibits, is a long time seller of trade show displays who continues to broaden its' web site product lines with improved product offerings such as trade show flooring, and the exciting new exhibits in the modular hybrid displays line. To sustain this growth, ShopForExhibits has just launched a new web site that gives the user a host of enhanced customer and product support features. Facing uncertain economic challenges, the online trade show exhibit retailers such as ShopForExhibits, are working diligently to provide not only reasonable price points for their products, but exceptional values in terms of ways of visually imaging a businesses' message, to quickly motivate prospects to buy. Not every business will succeed in successfully bringing new products such as tension fabric displays, to market via the internet, but ShopForExhibits has positioned themselves in a positive way through their industry and product experience, and on line communication skills, to have the best possible opportunity to succeed in this most competitive industry.